Infinity Warps #1 review: 'What If?' for a new generation – AiPT! A quick, What If?-style collection of short stories, all given to us by Watcher-X, a mixing of Professor X and Uatu the Watcher. I love when comics companies anticipate my neediness. After beginning Infinity Wars, I NEEDED to see adventures of the various smashed-up heroes of Gamora’s new universe. Marvel delivered. Kind of. In Infinity Warps #1, we get a quick, What If?-style collection of short stories, all given to us by Watcher-X, a mixing of Professor X and Uatu the Watcher, who in-X-plicably talks while X-pressing every “x” involved in his X-cellect vocabulary. It’s funny until it’s annoying. And then it’s funny again. The three stories inside this X-shaped framework are of “Moon Squirrel and Tippysaur,” “Green Widow,” and “The Terrific Two.” All of these hit their mark, bringing the campiness of their original style to this new take. I have a soft spot for Squirrel Girl, so seeing Ryan North’s take on “Moon Squirrel” made my day. Including “Squirrel Girl”-esque footnotes referring to multiple volumes of comics made me wish that this wasn’t a one-off adventure. Defeating Doctor Doomactus in such a Moon Girl/Squirrel Girl fashion, not only for Earth, but for other planets in the universe, just ties this episode up perfectly. “Green Widow” was an unexpected twist, pairing Black Widow with She-Hulk. The art by Francisco Herrera is unreal, gathering the comic book style and mixing it with his almost Bluth-ian take on the Marvel Universe. Having Widow partnering with the Hawkeye mashup makes sense, but I was surprised to see Hellcat as her other half. Cat’s Eye and Green Widow. That is a program I would watch. The story is fairly straightforward, but teases a potential partnership/relationship that I think would really play. While most of our hero and villain come from the same team or series, “The Terrific Two” come from the same family. Ben and Reed Storm, brother scientists, get struck with cosmic radiation and become Mister Invisible and Hot Rocks. Hot Rocks? I mean, I get it, but it’s the only mashup name so far that isn’t a direct portmanteau of the original heroes’ names. Well, they save the day from Master Mole, creator of Sentinel Mole-bots. It’s crazy pants, but drips with the language of the late Stan Lee: over-the-top and campy as hell. The teams on this book have put together some fun combos that speak directly to their respective audiences. Luckily, the pairings all work with the writing pretty well. 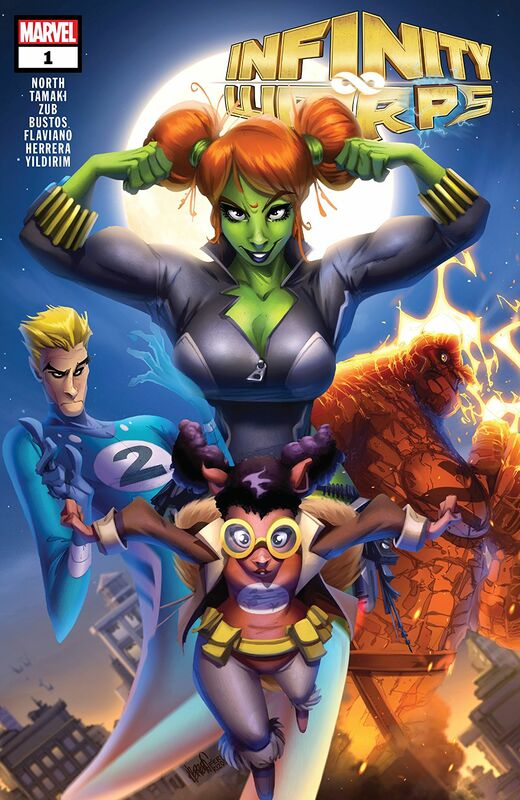 I’m not sure how pairings like “Squirrel Hulk” or “Iron Widow” would have worked. Actually, I kinda want to see “Iron Widow.” Marvel! Make my dreams come true! The teams on this book have put together some fun combos that speak directly to their respective audiences. Luckily, the pairings all work with the writing pretty well. I'm not sure how pairings like "Squirrel Hulk" or "Iron Widow" would have worked. Actually, I kinda want to see "Iron Widow." Marvel! Make my dreams come true!